Research collaborators will be paired with students and a mentor. The Okeanos Research Laboratory is dedicated to understanding the cellular mechanisms of calcification and biofouling in marine invertebrate organisms. The lab accomplishes its mission using fluorescent, confocal, multi-photon and advanced electron microscopy techniques. To improve digital data analyses, storage and presentation of these often complex and multi-modal datasets, the lab will begin to implement the Open Microscopy Environment (http://www.openmicroscopy.org/site) in the summer of 2017. The lab is looking for a highly motivated, knowledgeable and capable REU student to assist with this project. Melissa Smith (Electrical & Computer Engineering) and Alex Feltus (Genetics & Biochemistry) collaborate on developing GPU accelerated systems biology software. As a summer REU visualization intern at Clemson University, you will build upon existing software called the Biological Dependency Visualizer (BioDep-Vis) which is a fully functional interaction framework built using CUDA and OpenGL for nVIDIA GPUs. BioDep-Vis is currently available on Palmetto Supercomputer as an application used in conjunction with VNC and VGL on NVIDIA K20s and NVIDIA K40s. 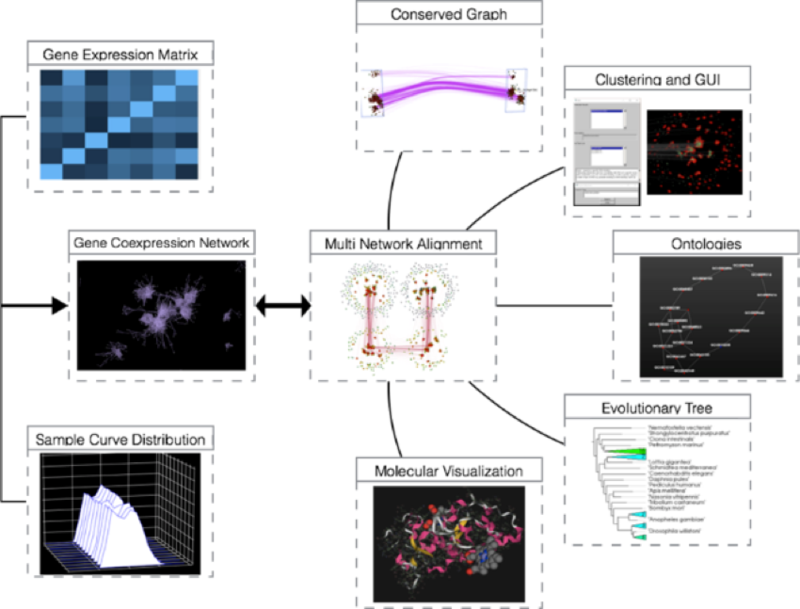 Core features on BioDep-vis include gene expression matrix distribution and biograph visualization, GPU calculated force directed layout of biographs, ontology mappings to nodes, and molecular structure visualization. Experiments are configured using a Python-Qt configuration generator front end that by user-defined data and metadata from local flat files. A key feature is that the software allows for the detection of conserved subgraphs via an nVidia CUDA/GPU-enabled graph alignment package we developed called G3NA that aligns two biographs based upon shared node sequence homology and topology. G3NA is an ultrafast algorithms and allows for the detection of conserved gene patterns in seconds for the scale of biographs we are constructing. Cerebro-vascular diseases such as brain aneurysms are a primary cause of adult disability. The ﬂow dynamics in brain arteries, both during periods of rest and increased activity, are known to be a major factor in the risk of aneurysm formation and rupture. The Schiller Research Group and collaborators use large-scale simulations for modeling cerebrovascular blood ﬂow. We generate patient speciﬁc geometries of brain arteries and simulate blood ﬂow over a range of cardiac parameters . The simulations provide quantitative indicators (e.g., wall shear stress) which can help clinicians to assess the risk associated with vascular defects. The simulation generates large amounts of data in 3D space and time, and it is not always obvious how to extract meaningful quantities. The images below show a 2D slice of a snapshot of the ﬂow velocity, and a 2D projection of the wall shear stress in a model of the middle cerebral artery. In this project, we will develop a dynamic 3D visualization of blood ﬂow in the middle cerebral artery which will allow to explore the ﬂow patterns in 3D space and time throughout the geometry. The REU student will work with graduate students and research mentors to utilize the capabilities of Clemson’s Advanced Visualization Division to develop better dynamic visualizations of blood ﬂow simulations in 3D geometries. M. A. Itani, U. D. Schiller, S. Schmieschek, J. Hetherington, M. O. Bernabeu, H. Chandrashekar, F. Robertson, P. V. Coveney and D. Groen. An automated multiscale en-semble simulation approach for vascular blood ﬂow. J. Comp. Sci. 9, 150 (2015). A wide range of emerging technologies are available to create virtual reality experiences that can take us on journeys to explore regions of the world that we might never otherwise be able to visit – ranging from polar ice caps to tropical forests. In particular, 360o imagery is becoming increasingly easy to capture, edit, and annotate to engage people in deeper, interactive virtual field experiences. This project will evaluate different techniques and methods for creating interactive virtual reality field trips, including experiences that integrate imagery and other content within the setting of the virtual world with an emphasis on educational field experiences. We now live in the IOT age where devices are constantly producing large amounts of data. This has led both businesses and governments to use machine learning algorithms that have the capabilities of exploring data through statistical based techniques for gaining insight. Where the insight gained is used in later stages by stakeholders to inform a future decision. However, the downfall of the most successful learning techniques is that they are considered black box solutions, sacrificing explanation for accuracy. This means that stakeholders only know that when given a certain input that this is the output produced by the algorithm and not how it arrived at the output. The objective of this project is to have to students create a visualization framework capable of explaining the steps the learning algorithm takes before producing the output. One possible avenue this project could explore is a Virtual Reality Interface. Design computer algorithm to look through the NBI and collect desired information about every US arch bridge. Once the desired information is collected, the algorithm could then categorize bridges into groups based off of desired similarities, e.g. damaged or undamaged, multi-span or single span, etc. Additionally, if coordinates of the bridges are available, should be in registry or on web, the program could use those to create a map that shows the overall locations of the bridges. The map could be subdivided into regions or used to show all bridges that fall into the same category recently specified. The map will be a helpful tool for the experiment because it can be used to help better determine which bridges would give the best results when being modeled. Additionally, I do not know if there is a way to do this but if you could code the same algorithm, or create a new one, to take the categorized information and insert it directly into Ansys it would severely reduce the time required to model a bridge. The thought here is that the person creating the FE would only need to type in a bridge number, previously assigned, into the program and the algorithm would pull all the desired information and insert it into the Ansys code; from there the designer would only have to worry about the specific details unique to that bridge. This would greatly reduce design times and would help prevent any coding typos caused from entering large amounts of information. Information regarding the local seismic, wind and flood hazard profiles will be needed for each bridge. Instead of having the researcher go through and find this information piece by piece for each bridge, an algorithm could be used to search the web for the researcher and pull the desired information. If the coordinates of the selected bridges are known this task should be pretty straight forward. This process would save the researcher a lot of time because they would not have to jump from website to website looking up information on a bridge by bridge basis. CloudLab is a large-scale, distributed scientific infrastructure on top of which many different clouds can be built. CloudLab allows researchers to try out ideas using any cloud software stack they can imagine. It accomplishes this by running at a layer below cloud infrastructure. It provides isolated, bare-metal access to a set of resources that researchers can use to bring up their own clouds. These clouds may run instances of today’s popular stacks, modest modifications to them, or something entirely new. CloudLab is not tied to any particular particular cloud stack, and supports experimentation on multiple in parallel. CloudLab is currently experimenting with two GPU nodes (K40M) for scientific and engineering visualization.The student will be involved in exploring architectures to support applications like remote visualization in Paraview within Cloudlab. Bullying is a complex and abusive form of peer violence that has potentially serious social and mental health consequences for children and adolescents. Bystanders are onlookers to bullying situations and can stand by and do nothing, encourage the bullying behavior, or intervene by helping the victim. Although bystanders comprise the largest percentage of students in a school, they do not always intervene on behalf of the victim. In a recent study, most students in the sample reported feeling sorry for students who are bullied. The same study found that a minority of students report that fellow students frequently try to stop bullying, and this number decreases in higher grades. The disparity between empathy and action indicates that students need the right tools to help them respond to bullying. This project will focus on creating a tool that will allow students to experience bystander behavior. The goal of this project is to create an App/Game that will provide an interactive way for youth to learn about the different roles a bystander can play in a bullying situation. The goal is to create a predictive model for the different resources (e.g. lighting, water, outlets, AV and HVAC) of the Watts Center. The campus basemap project created a functional, intuitive, and interactive map of Clemson University made available to everyone at Clemson to use for their own projects. This map included thematic layers, such as buildings, streets, parking lots, restaurants, and trees, each represented in the basemap using an appealing representation.